Child labour has been gripping the world at a very fast pace. But in India, this rate is quite alarming. This rate needs to be controlled as soon as possible not only in India but globally. In a broad sense, child labour simply means employing children illegally at workplaces. This is strictly prohibited under law and those who are caught employing children who have not attained working age will be treated by law. Though rules and regulations are not strict in India, the day is not far off when we would see our country working towards bringing an Empanelment that work for the rights of children. The actual definition of child labour can be technically explained as the fearless violation of the child rights act, wherein the act provides protection for the child and safeguards him by providing him with safeguards he is entitled to. When child rights are not followed properly and the society misuses them to employ them in conditions unfit for their working, it is grossly equivalent to child abuse. Child abuse and violation of child rights at workplace lead to a scenario that is discussed in the later part of this article. Children under the age of 17 are strictly prohibited to take part in any kind of economic activity that will provide those wages. In many cases they may be employed under worst conditions and may not even receive wages. So being part of a work environment, even if it’s for a few hours under the age of 17 is grossly treated as child labour. 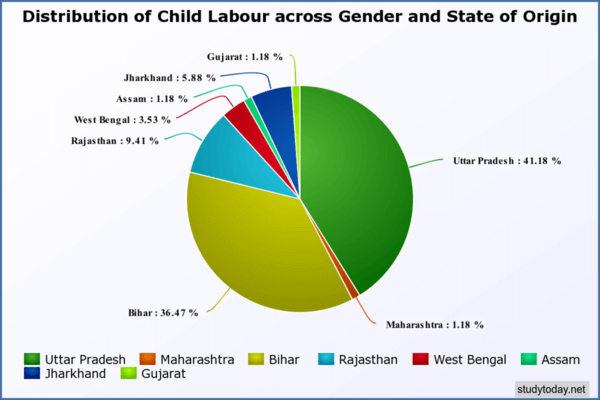 In India, child labour occurs in various forms. Some of the most common types of child labour include bonded child labour, child labour in the mining industries, in manufacturing sectors, in domestic jobs, in fireworks industries and the worst of all, in the trafficking menace. If we employ a small girl to work as a maid in our house and the girl happens to be under the age of 17, then that is treated as child abuse and we would be booked under Child Labour Act. We can find many young boys and girls working in the fireworks and perfumed incense stick industries. These kinds of tasks are easily performed by young boys and girls and they don’t have to be paid too much. So, cheap labour is a cause of child labour in India. In the manufacturing sector, children can be easily employed to do not-so-tough jobs like packaging work. These are identified as simple and can be done by small age groups with a little training. Hence, not very high skills are required to employ children in this category. It works in both ways for the industries. Firstly, the cost of employing a child would be definitely less compared to employing an adult, secondly, there is no training cost involved in teaching a child how to package things. In the fireworks industry, particularly in the southern regions of India, there are huge factories employing children to work on fireworks. Children are employed to coat the fireworks with a chemical substance that is not just harmful for their skin but may be hazardous to their health too. In case of scented incense sticks, children employed in these types of industries tend to inhale the chemical coated on top of the incense sticks. Long term inhaling of these substances can cause injury to the respiratory system. The bonded labour system is a banned system, for both adults and children. But in many remote parts of our country, these practices continue to exist and even children are made part of the inhuman practise. A certain less known fact lies in employing children in cigarette industries. This is not talked about openly in the public since smoking itself is considered injurious to health. Smoking ads have been banned by the government recently. Due to these strict norms, nobody discusses in the open about children being employed in their industries. Rolling nicotine rolls and placing a tobacco may seem easy for any child to do, but the detrimental effects on thousands of children is hardly ever thought of. 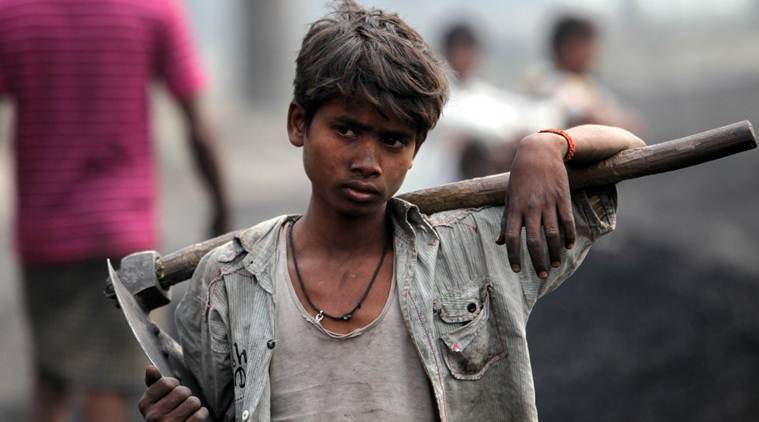 So, these are some of the types of child labour that we commonly see in India. There are many more depending on the type of industry a particular child is associated with. 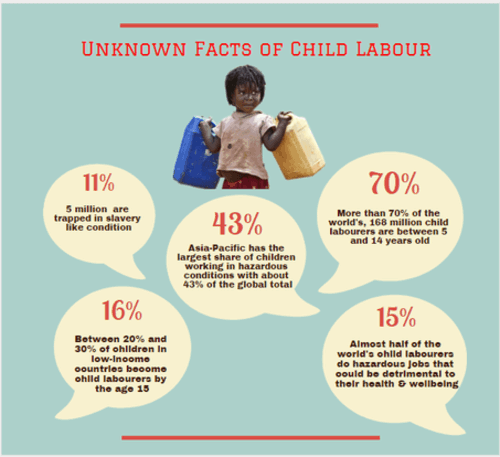 In India, child labour is a major problem because of the many reasons. The fact that child labour is easily available and cost-effective puts it at the top most criteria for people to employ children blindly without taking note of their future. For example, if we go to any suburban hotel in any part of our country, we are sure to spot at least one helper or cleaner being a guy under the age of 17. Rules are made to prevent child labour acts. But the correct implementation of these rules is far from reality. There is no check in place. There are no officials who would check if these rules are strictly enforced. So in India, the situation is more likely that rules and laws made are only for purposes of printing on paper and not beyond that. The correct implementation of these rules would come to light when people start thinking about the children they have employed. If we take our car to a service centre, we can find a whole lot of boys doing service work for the cars, cleaning them up, checking up the parts of the vehicles, etc. The cheap labour these small guys are entitled to works as a double whammy for both the employer as well as the working guys. The employer makes a profit by employing small guys at cheap rates. Guys whose families are stooped in misery and financial breakdowns are forced to go to work for making an earning to run the family. Poverty and financial imbalances in society are therefore, trouble creators and their effects are seen directly on children. Child labour (Prohibition and regulation act) was formed in 1986 to protect children against working in factories under the age group of 14. Persons found to be employing such children will be imprisoned for 3 months (extendable up to a year) and a fine imposed for INR 20,000. 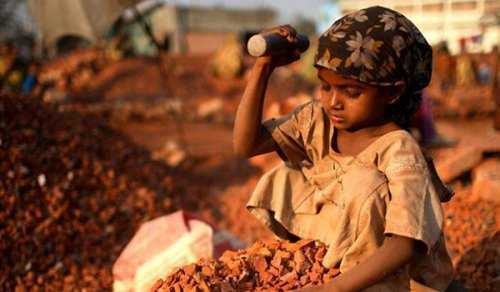 A national policy on child labour was formulated in the year 1987. The article 24 of the Indian constitution prohibits child labour in India. The factories and Mines act also have special provisions to protect the rights of children. These are just some of the rules and regulations present in India to protect children against child labour. But the issue is about the effective implementation of these acts and ordinances which has not taken place as yet. If there were strict enforcement, children would not be employed so easily in various work forces. People do not tend to the rules with fear, they know very well about the lenient nature of these regulations. Hence, approval or disapproval of these entitlements do not come into the picture in most of the cases. India is plagued by many social evils that bring a very bad picture to the nation and people belonging to the country. Due to a certain section of the population that involves children in such activities, the entire society faces threat from becoming part of illegal activities. Since long, there have always been cases of child labour thronging the country and have been a very bad impact on the society. Today, looking at the facts and figures we can still claim that the situation hasn’t improved much in spite of strict enforcement of law and the judicial grounds. It is high time we look into these aspects with deeper perspectives and set our thinking forces into action. Child labour is a practice where children engage in economic activities on a full time basis. The practice deprives children of their childhood and is harmful to their physical and mental development. Young children are enrolled in many business activities, house hold activities or forced to work in industries, totally ruining their future. At a time when they should be attending school and play with other children, they are being enrolled in activities that deprive them of the very essence of childhood. There are countries which are facing worst form of child labour in the form of child slavery. In such cases, they use children for illicit activities such a drug trafficking, exposing them to much hazardous work that is likely to harm the health, safety and morals of children. It has been noticed that many industries such as coal mines and others that prepare chemicals like silicon, aluminum etc. employ children to carry out harmful tasks in their work areas. This turns out to be even worse for the children as they end up suffering non curable disease and contract infections that may sometimes prove fatal also. Child labour is not just an issue, it’s a social menace, right from the law makers to the normal citizen, everyone is involved in helping this social issue grow from its seeds to a big tree. It has plagued India since time immemorial when strict enforcement’s were not prevalent. Today, we find many people openly involving people in child labour activities and being proud of it as they are not afraid of lawmakers and are quite happy about doing so. There are several reasons behind the causes of child labour and over population being one of the biggest and major factors. Other possible causes could be poverty, lack of social security, lack of proper education or no education, no visible alternative measures to make a livelihood. Worst of all, the high prevalence of low income groups in a developing economy like India where rigid labour laws and numerous strict regulations are rampant make it even easier for the growth of child labour in the organized sector. Girls are the ones who are the most deprived and underprivileged among all children. The population of India has been growing at an alarming stage and will soon cross China, which is currently holding the top position in terms of most populous country of the world. In such a scenario where an underprivileged family has a minimum of three to four children, there is not much scope for people to earn well. Hence, they make their children their own desirable medium to earn daily wages for the family. It’s a normal scenario that people having more than two children (in fact people are preferring just one kid these days) are facing difficulties in planning for their kids’ education, clothing and jobs. Children who belong to the poorer sections are forced to help their parents and siblings financially for their livelihood. In developing countries unemployment is a major problem and on account of this, they cannot afford even the basic of facilities like food, shelter, clothes etc. Children can be found employed in mines and industries, apart from other skilled areas like artisan jobs, etc. They have to work to make a livelihood out of it and to generate income for their family. People who belong to the underprivileged sections of society tend to believe that the more number of off springs they produce, the more the working hands they receive to fulfill their daily needs. In an educated society, the scenario is quite different. People understand the importance of attending school and the primary reason for getting employed in government jobs or in other good firms and MNCs. On the other, illiterates undermine the value of education and do not realize the importance of going to school and further seek employment in a government job or in other good positions. To see their children come out in flying colors in the future, they do not have big dreams or aspirations, hence they are limited to their own cringing world. Being unemployed are one of the major issues in India, one of the major reasons being early marriage and also contributing to the factor of overpopulation. It is practically impossible to create jobs or offer employment opportunities to all citizens of the country. On account of this, children are forced to help parents for their income and seek out on child labour. For providing quality education, parents have to spend more money to get their children enrolled in good schools. Today, many children don’t attend school for the sake of education, but rather stay at home losing out on precious time, simply because they cannot afford expensive education and the lack of important degrees and skill sets makes them unskilled in job fronts. This could also play a major role in increasing child labour cases. The Government of India has provided right to education to every child of India till the child reaches the fifth grade in school. Government schools offer education at low and affordable rates to make education reach every child, so that child labour can be handled till a certain level and to avoid them in indulging in any economic activities. But still poor people don’t understand the value of education and make their children working unsafe zones. These factors are depriving them from their basic compulsory education. Letting children to get involved in age inappropriate activities leads to many bad influences on the child. Some children suffer a bad childhood because their parents create a hostile environment for them, some others are unprivileged because they cannot afford good education and a basic livelihood, and some curse their own being as they are handicapped off their very existence by a section of anti-social elements in the country. Life does not offer a smooth ride at every stage. It is said that childhood is the golden period of one’s life and we cannot afford to get it back whenever we want it back. Children should be allowed to play with their friends and make their childhood memorable. Child labour, as a deadly evil, deprives children of a quality childhood as children engage themselves in hazardous work areas like mines and industries for their livelihood and to generate income for their family. If children start working at such an early age they can in no way enjoy their childhood or have pleasant memories of a good childhood. If young children are forced to work at their tender ages in mines and industries, they are prone to various health issues and hazards, while they won’t even be having stamina to face mental and physical problems. Working in mines and factories can lead to serious respiratory problems and can become lifelong victims of such dreaded diseases. If children work in the mines and industries for their livelihood and to help their parents and siblings for generating money, they obviously cannot go to school for their education. Education can help them to be self dependent and walk on their own feet in the society. Sadly, if we are not educated and are unskilled, we would not be employed by any good hirer and have to lead a life full of struggles. As children remain uneducated they lose out on their sense of what is good and what is bad and many of them naturally tend to indulge in criminal activities. This is a serious issue and of late, government is taking up strict measures to deal with it. Many juvenile cases have been reported and are increasing at a very fast rate. It’s the moral responsibility of parents and teachers to take care of their children, guide them properly and monitor them. When children who are not very privileged to be part of a larger civilized society see other children in a better picture playing, making merry and enjoying them, they are filled with thousands of stress creating questions about their existence and economic situation. They are emotionally disturbed. And these emotionally disturbed children easily get influenced by criminal activities and take to anti-social elements very early in life. Every problem has a possible solution. Yes and even a big menace like child labour can be stopped and prevented in a large country like India. It all depends on changing mindsets and evaluating situations from time to time. Strict enforcement’s of laws together with rapid action committees to bring about execution of laws will be torch bearers for a better tomorrow and can throw light in the aspect of changing many innocent lives. If free education for one and all is made mandatory by the government, then to some extent it helps to check child labour. This is especially helpful for parents who have very poor financial aids to allow their children to seek education and in the long run, benefit the society at large, especially the impoverished and underprivileged groups. Mid-day meal schemes can also can be provided to children for their daily food needs. Good educational support creates an independent standing for a person in his community and in the society he belongs to. If a good awareness is created among citizens for eliminating child labour then it can be stopped to a large extent. Parents should be aware of the benefits of education and should send their children to school for their formal educational process. In this way, they can become self dependent and on par with others in the society, landing them in good jobs for their sustenance and livelihood. To bring about awareness, social campaigns should be created and inform citizens about the problems of child labour and related health issues. Children from poor families are most likely to get involved in child labour cases. They are exploited by rich and influential people for managing their household work. It’s not right on the part of affluent people to bring in helpless people from their communities and involve them in age inappropriate chores. It goes against laws and if we also take up initiatives to empower them enough, then they cannot be exploited by such persons. Indian Government on their part has done a fascinating work in carrying on their mission of eliminating child labour from India. They have made strict rules such as Factory act and mines act which prohibit any children to work in such hazardous environments. Plus they have also made rules for free education and mid-day meals in various states of India which has currently garnered an overwhelming response from all sections of society. There is an urgent need for making education mandatory, not only for children but equally for parents to bring in a bigger perspective regarding the upbringing of their children. They should be well aware of the consequences of child labour and how it can affect their child’s life. The citizens, on moral grounds should not rope in younger children less than age of 14 and force them into household activities or other workshop related work. In fact if anyone sees any person misbehaving with children or forcefully employs them, they should be immediately taken under the action of law and such persons should be immediately reported to the authorities. Children are god’s most precious gifts to human being. It’s not good to ruin their lives by employing them at inappropriate ages. We should allow them to enjoy their childhood to the fullest. A well groomed child will become a responsible citizen of the country and will respect others and same will be carried forward to the coming generations. People should come forward and join hands in removing child labour from India completely. It’s not a single day job but if we all work together towards the cause, then nothing is Impossible. Let’s hold our hands together and take pride in making our nation child-labour free and take our nation a step forward from developing to a developed stage. Over 27 million children do not attend school in India. Some are school drop outs, some of them do not attend school because their families don’t encourage them, and some of them are forcibly made to seek employment to support families. Out of this huge number, around 10 million children spend every day in their lives by being employed in some or the other factory or industry. Almost 70% of children employed in child labour activities are in the age group of 5 to 14. Almost 20 to 30% of these children are from below poverty line families. Almost 43% of the 27 million children are employed as domestic helps in houses. By educating the public about the ill effects of child labour. Child labour is illegal. This statement should be etched in the minds of people who propose to employ children at their workplaces. People should not only be told that child labour is illegal, but they should be enlightened about the fine and imprisonment that they attract if they happen to enforce child labour in their companies. If we really want to stand up against child labour, then we must join hands with an NGO or a social service center that fights for the rights of children. We must make effective use of child lifelines and if we spot children anywhere being employed for work, we must immediately call up the help center and aid them in rescuing such children. Children are the most precious gifts from God. We have to nurture them and provide them opportunities to fly with bright colors. “Eradicate child labour else the country may soon see a degradation of rich talent going in for a waste”. “Child labour destroys the future of children; the future of the country is at stake due to this”. “Employing children for free and cheap labour is equivalent to moral destruction of many innocent lives of the country”. These days there are many public campaigns carried out by various organizations and volunteers to act against child labour. People come out in the open and are no longer confined to the comfort of their rooms to voice their concerns. They use effective tools of technology to validate their thoughts and act accordingly. “Children need freedom for their development, bonding them under child labour is a crime”. “Child rights and child freedom are gifts from god; let us not invade their territories”. In a particularly interesting case, a small town boy from West Bengal accidentally came into the hands of an agent who used children for easy money making. He would stealthily catch hold of children or take them away from their parents and cheat them. He would actually steal children and once children are in his clutches, he would harass them and leave them homeless. He was operating in a big network and his circles were present in south Indian regions. He grabbed this particular boy named Ranjith who was just 14 years then and took him over from a small town in West Bengal all the way to Kerala. In Kerala, he had connections with a small time gold shopkeeper and handed over this guy to him. Ranjith saw the worst times of his life. The shopkeeper made him work for almost 14 hours a day. He was left with no food and no sleep for days together. He was physically and mentally abused at many times. The shop owner brutally hit him if he disagreed to doing his tasks. He was morally disgraced and the boy entered depression gradually. But, he mustered courage and on the pretext of going out for some other reason, he found a way to escape from the clutches of the shop keeper. Not familiar with the place in Kerala, he ended up somewhere at Kozhikode. The police at Kozhikode saw this particular guy wandering homeless and planned to rehabilitate him properly. The personnel acted with concern and took him to a rehabilitation center where he was further referred to a child care center at Calicut. During his stay at Calicut, the child began to feel better and started improving. With company of other children and friendly staff, he began to open up on his past experiences. During one of his counseling sessions with an expert in child care, he briefly talked about his abusive master in the form of gold shop owner. He further threw light about the agent operating in circles and how he was nabbed by him. The personnel at the child care center took up this matter seriously and soon informed the police about it. The police acted swiftly. They sat out to nab the agent. 3 police personnel forming a group, including a lady sub inspector hatched out a plan to nab the agent. The agent was found out by police sources and was contacted by the lady sub inspector who told him that she was actually a teacher. She made the agent believe her that she wanted money. In return for money, she was ready to hand over Ranjith who was under his custody till some time ago. The tricks of the police had worked. They contacted the agent again and told him the venue from where he could come and collect Ranjith. The agent gave in. Instead of him, he sent one of his men to the pre-discussed spot. The police personnel, all three of them, arrived at the spot in plain clothes and successfully nabbed the agent’s man. The agent’s man, upon strict interrogations, revealed his own identity and gave vital clues about the agent’s whereabouts. Finally, the agent was tracked down and nabbed. Technology also played a major role in tracing the agent and nabbing him. The culprit was given his due punishment and booked under law. The gold shop owner was also booked under the child labour act and was fined severely. Thorugh several interrogations, it was finally revealed that around 6 children were trapped by the agent in total and he was part of a bigger network. The network was traced down and all the six children were freed from their clutches. They were provided proper rehabilitation under the child care center in Calicut. Ranjith was luckily sent back home and re-united with his family in the small town at West Bengal. Not everybody is as lucky as Ranjith. In most of the cases, children go unnoticed in crimes and become part of bigger networks that deport them to different parts of the world. They can hardly be traced back or re-united with their families. Many of their identities would be erased and they would be totally blacked out. In Ranjith’s case, it was the police which played the most crucial role in not just rescuing his life, but also providing a new life to six other children who were part of the trap. The right attitude towards rescuing children and giving them their due rights provided the right steps in the right direction. The case had many turning points but the police handled them with their intelligence. We salute such people and applaud them in our society. They are a true asset to the country and its citizens. We may also come across similar child care centers operating in different parts of the country in various different ways for the welfare of children. Some of the noteworthy mentions include CRY (Child Rights and YOU), Child line India foundation, Save the Children Foundation, etc. We should understand that child labour is a problem, not just in developing countries like India but exists in developed countries as well. The police cannot arrive at every workplace to check if there is existence of child labour. People and their mentalities should change to put an overall end to this issue. People should be educated; they should be enriched with morals and values to stop this menace. They should be morally made responsible for their own acts and they should be made to own their mistakes.